January 25, 2013 DepEd Order No. 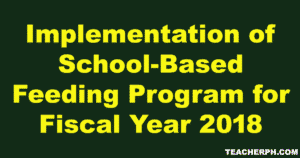 5, s. 2013 POLICY GUIDELINES ON THE IMPLEMENTATION OF THE SCHOOL READINESS YEAR-END ASSESSMENT (SReYA) FOR KINDERGARTEN To: Undersecretaries Assistant Secretaries Bureau Directors Directors of Services, Centers and Heads of Units Regional Directors Heads, Public Elementary and Secondary Schools All Others Concerned 1. Pursuant to Republic Act (RA) No…. October 12, 2011 DepEd Order No. 79, s. 2011 Creating the School Sports Events and Activities Unit (SSEAU) and Dissolving the Task Force On School Sports (TFSS) To: Undersecretaries Assistant Secretaries Bureau Directors Directors of Services, Centers and Heads of Units Regional Directors Schools Division/City Superintendents Heads, Public and Private Elementary and Secondary Schools 1….